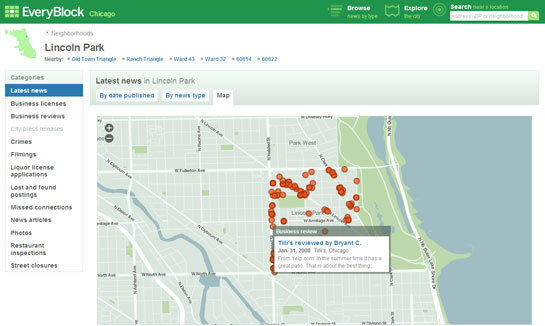 The site compiles all the openly available public records and then slices and dices them so that they are easily accessible by zip code, address or neighborhood. EveryBlock gracefully pulls together local news, local events, crime reports, Craigslist personal connections, local photos from Flickr, business reviews from Yelp, city press releases, movie filming reports, liquor license reports, restaurant inspections, street closures and lost & found postings. The site offers a number of unique views of the data which includes charts and maps. 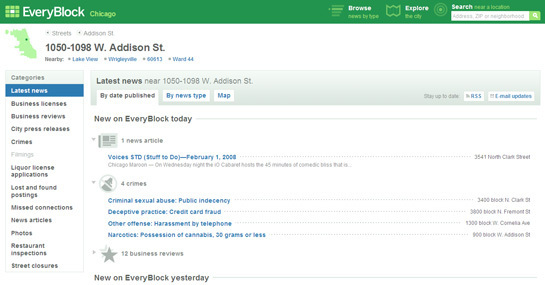 EveryBlock is an excellent tool for anyone looking to find hyper-relevant location-based news. There is currently nothing on the Web like it. I caught up with Adrian Holovaty at TECH cocktail Chicago 5 in July 2007 and we talked about EveryBlock when it was just a new project. He was just getting rolling on and I am happy to see it has launched - it looks super. Check out the Adrian Holovaty video interview (below). Related EveryBlock stories include articles on TechCrunch, Signal vs. Noise, Gawker, Search Engine Land, Download Squad & Curbed.